Americans love to celebrate the founding of their country in all sorts of creative ways – and not just by blowing stuff up. Some display national pride by attending or participating in 4th of July parades. Some eat their weight in hot dogs and potato salad. Some dress up themselves, their homes, and even pets in amazing red, white and blue ensembles. 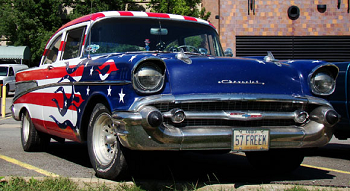 This patriotism extends even to their cars, as owners find fun ways to show their spirit with cool modifications. Maybe the following displays can inspire you to dig a little deeper to find you and your car’s Spirit of ’76. Butler Auto Group spotted this 1957 Chevy Bel Air from Ohio that has been decked out in all sorts of colorful ways, including a classic flag image but adapted to look like cool flames. It’s the type of car and design that will attract attention from fans of classic cars along with fans of Americana. In addition to admiring great ink on people and cool airbrush art pretty much anywhere, Hollywood Body Tattoo loves to share pictures of cars that are also enhanced with cool paint jobs. 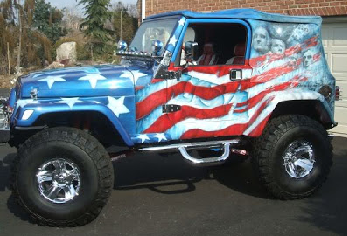 Like this Jeep that makes you want to stand up and salute with all sorts of patriotic elements, from the Liberty Bell to Mt. Rushmore. 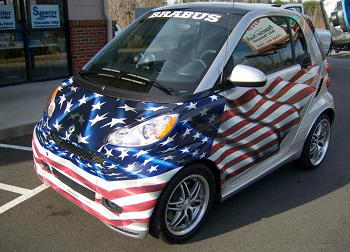 A SmartCar owner in North Carolina found a studio in their home state which was willing and eager to decorate their ride to show off their patriotic spirit, and also let the world know that you don’t need a big car to create cool designs. Every size of auto can be considered a super canvas to display something cool. A good rule of thumb about style is if Pottery Barn likes something, it automatically must be super cool. And one of the retailer’s social media folks gave a ‘like’ to this Pinterest photo of a classic pick-up in the country taken by Shannon Lowry. The truck, like the flag, looks strong and sturdy. Let’s hear it for the red, white and blue, especially where classy cars come in. And you can’t get much classier than this Rolls-Royce that has been painted to look like a lovely flag, complete with the right number of stars and the right number of stripes. Even NASCAR provides the patriotic feels when Kyle Busch unveiled a very special paint job in 2011. While his No. 18 car usually is covered with sponsor logos like M&Ms or Skittles, he decided the 10th anniversary of the Sept. 11, 2001, attacks was a time to be serious, so he and his crew covered up the sponsors to remember the lives lost. His whole car instead was covered by red, white and blue stars and stripes. 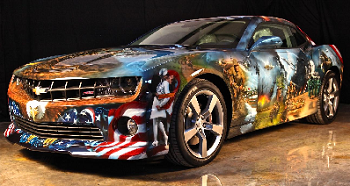 Airbrush artist Mickey Harris has created some impressive projects over the years, but one of the most popular has been the “American Pride Camaro.” Here, he took one of Chevrolet’s sportiest classic cars and transformed it into a collage of all things American, including a variety of iconic scenes over the country’s history, plus a cool screaming eagle right on the front grill. 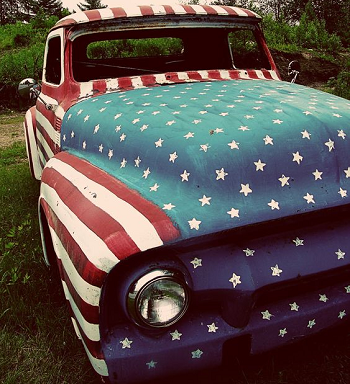 Hopefully these have given you inspiration to get out there and decorate your own sweet ride this summer, or at least jot down some ideas for showing off your patriotism in the future. It’s not hard; find a great artist or try your hand yourself. Take a defensive driving course to make sure your investment stays safe.